Sally, who was born with dysmelia in her lower arms, which resulted in her left arm not fully developing, took up athletics for enjoyment at the age of nine. As a result, she then joined Springwell Runners and began her competitive career in athletics. In 2009 Sally enlisted Philip Tweedy as her coach and a year later achieved a silver medal in the IWAS Junior Championship in the Czech Republic. 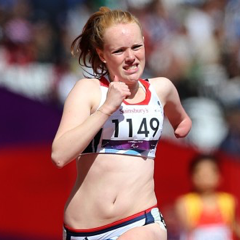 Sally’s time in the 100m and 200m sprint impressed many and, in January 2011, at the age of 15, she was selected for the Great Britain squad to compete in the 2011 IPC Athletics World Championships in New Zealand.